As you may already know from our previous posts, the window replacement process can be intricate. Just how complicated your project gets, depends on your needs as a homeowner. If you are making your decision based on price and speed of delivery, your criteria for a window company will be altogether different from a homeowner who is more concerned with home energy efficiency and functionality. These last two factors are directly influenced by the style and type of modern windows that you choose. As such, when comparing windows it is good to start comparing by type (ie. sliding windows vs. crank windows) and then get more detailed by comparing the different styles – slider vs. awning, or hung vs. casement. Each type of window has its own benefits, and that is often reflected in their price. Let’s find out how. First, let’s recap the difference between sliding windows and crank windows. A slider window is operated by pulling the sash side to side or down and up – and usually remains within the window frame when opened (both sliding and hung windows can be tilted inside the home for cleaning). A crank out window is exactly what it sounds like, it is a window that opens to the outside in response to the turning of the crank handle. Remember, regardless of the window style you get, your windows should be ENERGY STAR rated to truly be efficient in the geographical climate of your region. The first comparison is slider vs. awning. These two window styles are good to compare side by side, as both are best suited for openings that are wider than they are tall. The slider is one of the two most common types of windows (the other being the hung) that can be found in homes throughout North America. This window has two different variations: the single slider and the double slider. The difference between the two is that the double slider has two moveable panels, while the single slider only has one. As mentioned above, sliders are best for openings that are wider than they are tall. In fact, the slider may very well be the best-suited window for wide openings, as it provides the most unobstructed view while allowing for maximum ventilation. The width of the opening is also not a great concern for the slider, as it can even be adjusted for large openings by adjusting to an end vent configuration. As we mentioned in our previous post, the end vent is a picture window flanked by two sliders. It allows maximum visibility as well as great ventilation. Another benefit of the slider is that it can be cleaned fairly easily. Whether you choose to go with a lift out or tilt option, it is possible to clean both sides of the glass without climbing up on a ladder. The tilt option is practically effortless as the sash swings inside the home while still being supported by the frame. Slider windows are popular in kitchen and bedroom applications. The downside of the slider window is that it is not as energy efficient as its crank operated counterpart. While it meets industry standards for water and wind resistance and is Energy Star rated, it is simply no match to the compression seal of an awning window. Like the slider, the awning is also best suited for openings that are wider than they are tall. However, unlike the slider, the awning does not have the same size range as the sash simply becomes too heavy as the window gets bigger.If you are really intent on having awning windows, the solution is to make it a combination unit with either another awning or a fixed window. This option will take advantage of all of the benefits of the awning while overcoming its size limitation. The benefits of awning windows are numerous. Its crank out design makes it the perfect solution for hard to reach places like over the kitchen sink and allows for effortless opening and closing. Opening to the outside lets the awning catch breezes and, as a result, provide better ventilation than a slider. The other advantage of these windows opening to the outside is that your rooms can be ventilated even when it is raining as the sash acts just like an awning – hence the name! Light and visibility are other benefits of the awning window. Having a single sash with no dividers provides an unobstructed view and maximum amount of light. Awning windows provide maximum efficiency and comfort in any room they are put in. These windows are most popular for applications in kitchens. There are a few drawbacks to the awning. As mentioned earlier, its size is limited. Wrong operation of a quality awning window can also result in a decrease of functionality. “It’s a window, how is it possible to operate it wrong?” you may be thinking right about now. Believe me, it is possible. If you treat a high-quality awning (or casement window for that matter) like a low quality or old unit of the same configuration you will surely turn the former into the latter. This is principally done by over-torquing or over-tightening of the crank when closing the window. Even with the highest quality hardware, over-tightening will lead to the deformation of the sash and the loosening of the crank. The result is that the window will cease to be the bastion of energy efficiency that it is designed to be, and will instead revert to being a regular old window. A few other things that should be considered when looking at awning windows is the space on the outside and cleaning concerns. Unlike the slider, the exterior of these windows cannot be cleaned from the inside, thus it is highly recommended to install it on the ground floor (unless, of course, ladders are your thing). Now that you are on the ground floor it is again highly recommended that you check to see if the future window will be located in a high-traffic area such as a deck. If the answer is yes, you are strongly advised to reconsider as the fact that the awning opens to the outside will likely put it at the perfect height to deliver many head bumps. Now that you are familiar with the pros and cons of slider and awning windows we can look at hung and casement windows. To make this comparison go smoothly, take the knowledge that you have acquired above and rotate it by 90 degrees. What you have technically done is turned the slider window into a hung, and an awning into a casement. What this means is that a lot of the benefits and drawbacks that apply to the first pair, also apply to the second. To get a better idea, let’s take a closer look. Like the slider, the hung window also comes in two different variations – the single hung and a double hung. Again, the difference is that double hung windows have two moveable panels, and the single hungs have one. Both variations are spring loaded to ensure that when the sash is pulled up, that it stays up. The overwhelming benefit of this window is its ability to provide ventilation to a room. The double hung, unlike the single hung or any other style of window, can open from the top and thus provides extra security in kid’s rooms and keeps in-home offices organized by keeping the breeze at the top of the room. Hung windows, like sliders, are a good choice for meeting egress requirements. These windows are easy to operate with minimum effort and can be cleaned from the inside by tilting the sash to the inside. Hung windows are a great budget solution for openings that are tall and narrow. The main drawback of this vertical slider is the same that plagues its horizontal relative – energy efficiency. This is not to say that hung windows are not energy efficient windows, just that they are less efficient than others. An added drawback to the hung that doesn’t really affect the slider is the check rail effect. The check rail is the horizontal bar in the middle of the window where the two sashes meet. It usually ends up being at eye level and conveniently obstructs the view of the outside. 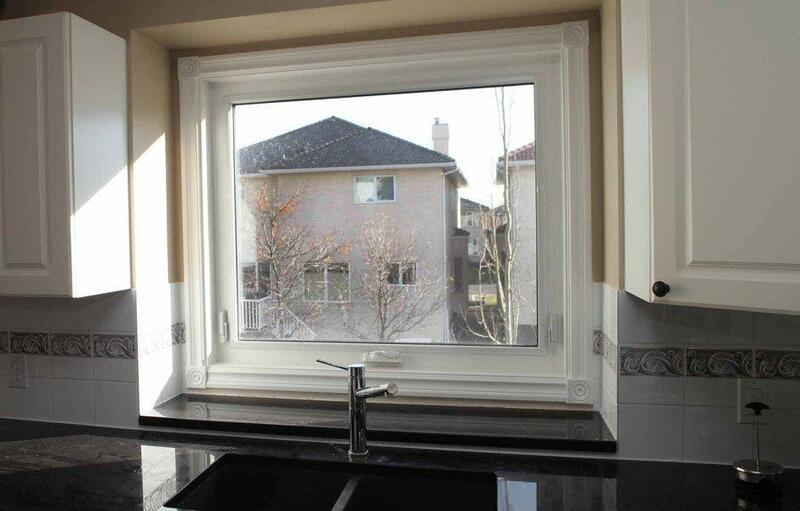 The casement is the ultimate ventilation window! Unlike the hung and slider windows, the whole window opens up to take in a breeze. Unlike the awning, the casement can be positioned strategically so that even a 2 to 3-inch opening would act like a sail on a boat and direct the breeze inside. Already superior in ventilation capability, the casement is also the superior window for energy efficiency. Its compression seal technology provides the tightest seal, effectively making the casement the energy efficiency king of windows. Additionally, casement windows are ideal for hard to reach places, provide an unobstructed view, are easy to clean and are generally hard to break into. Finally, what sets the casement apart from the awning for most people is that it can be cleaned from the inside. Combination casement windows are great for adding an opening to big windows without sacrificing comfort. Casement windows can also suffer from wrong operation, just like their horizontal counterparts. Knowing how to properly operate crank windows is essential for them to last a long time. The final similarity between casements and awnings is that the space outside should be considered as the casement opens to the outside as well and can be an inconvenience in a high traffic area. As you may have noticed we did not tell you which replacement windows are the best, which ones are better and which one you should get. That judgment is up to you. By knowing how each window will function in your home, you should be able to make a decision that is right for you, based on your unique window replacement needs. Modern Windows Compared: Awning and Casement vs. Slider and Hung Overall rating: 4.9 out of 5 based on 41 reviews.